We expect all of our suppliers to abide by the requirements of our Supplier Code of Conduct, which prohibits human rights abuses and unethical practices. We also require all suppliers to comply with applicable legal standards and requirements. On August 22, 2012, the U.S. Securities and Exchange Commission (“SEC”) issued the final conflict minerals rule under Section 1502 the Dodd-Frank Wall Street Reform and Consumer Protection Act (the “Conflict Minerals Rule”). The Conflict Minerals Rule requires publicly traded companies to report annually the presence of conflict minerals (tin, tungsten, tantalum and gold, or “3TG”) originating in the Democratic Republic of the Congo or adjoining countries (“Covered Countries”). 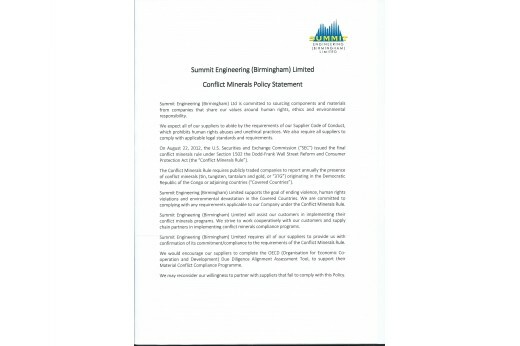 Summit Engineering (Birmingham) Limited supports the goal of ending violence, human rights violations and environmental devastation in the Covered Countries. We are committed to complying with any requirements applicable to our Company under the Conflict Minerals Rule. Summit Engineering (Birmingham) Limited will assist our customers in implementing their conflict minerals programs. We strive to work cooperatively with our customers and supply chain partners in implementing conflict minerals compliance programs. Summit Engineering (Birmingham) Limited requires all of our suppliers to provide us with confirmation of its commitment/compliance to the requirements of the Conflict Minerals Rule. We would encourage our suppliers to complete the OECD (Organisation for Economic Co-operation and Development) Due Diligence Alignment Assessment Tool, to support their Material Conflict Compliance Programme. We may reconsider our willingness to partner with suppliers that fail to comply with this Policy.